effortlessly slips a ZZ Top riff. But that’s just the prelude to him uncorking a ripsnorting solo, which is an indication of what’s to come. There’s an appealingly humorous air of braggadocio about him as he laps up the audience reaction, like a wide receiver who’s just made a mind-boggling touchdown catch. But he also speaks openly about his past addictions, and being clean for over 10 months now. It makes him want to share with the audience all the passion he’s feeling, he says. Those aren’t idle words either, as he belts into an effects heavy bash at ‘Boogie Man’, featuring a coda that’s ferociously wild in its intensity, followed by the aptly titled track ‘Freedom From My Demons’, from his 2006 album Crystal Vision. Starting off as a slow blues, it builds over a bass line that recalls ‘Dazed And Confused’ until Gales is letting fly with fret frying of rather wanton proportions, complemented by occasional twists into jazzy chords that add different colours. By the time he’s done, the guitar freaks in the audience are going nuts. At which point Gales decides to take a break and leave the stage to bassist Cody Wright and drummer Nick Hayes to embark on a funk fusion showcase, an interlude I could frankly do without, no matter how impressive the musicianship. No matter, when Gales returns he goes into a digression in which he plays around to good effect with the riff from ‘Don’t Fear The Reaper’, with a tone that demonstrates why he has a reputation for a Hendrix vibe. Next stop is a workout around a powerful ‘Smokestack Lighting’ groove – but without the benefit of vocals. Which is a pity, because when he makes the effort Gales is an engaging singer. But then his show isn’t really about songs, per se. In jazz fashion, songs are really just frameworks for him to do his thing. Gales’ wife LaDonna’s auxiliary percussion reaches manic heights, it relentlessly bends and shapes a buzzsaw guitar lick. 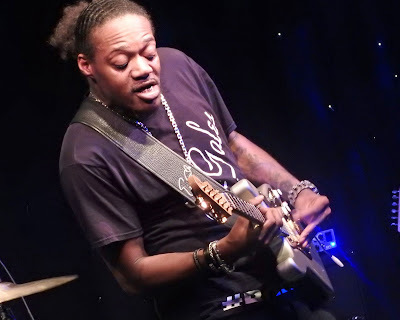 Playing his Strat left-handed in the manner of Albert King – ie, with the strings still strung as if for a right-hander – Gales’ left hand flutters with hummingbird speed, using both a pick and his fingers. ‘Voodoo Chile’ gets dialled up as a pretext for some funky experimentation, before Gales slides into a passage of solo classical guitar which would surely have had Blackmore purring. A growling version of the riff from ‘Kashmir’ is incorporated, along the way to him putting the hammer down on ‘Back In Black’. For an encore Wright fires up a blistering bass riff over which Gales goes bonkers, before they collectively funk it up – at lightning pace – until Gales ends up letting rip while sitting, then lying, on the floor. Time flies while you’re having fun. Me, I might prefer more in the way of actual songs and changes in mood. 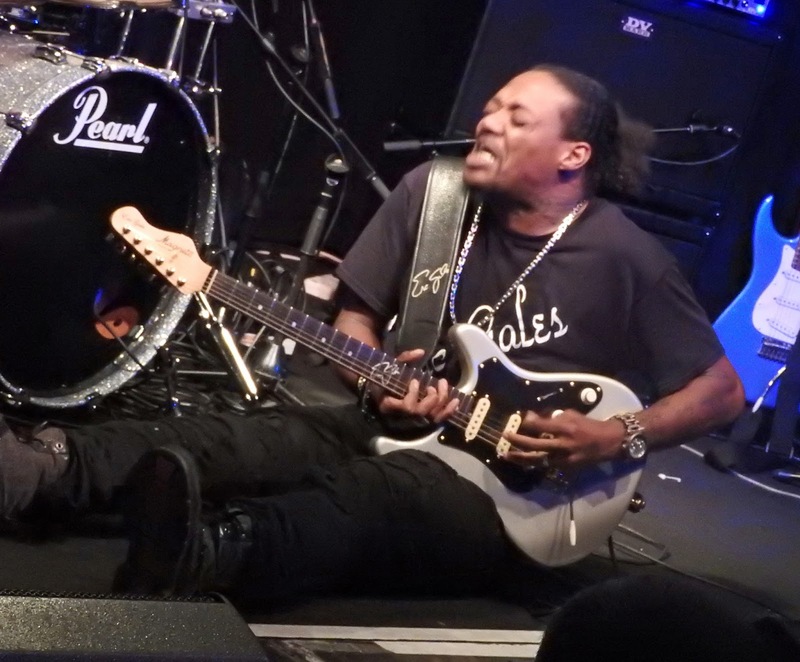 But there’s no denying that Eric Gales puts on one hell of a show, one that some long standing fans had evidently waited a long time to see, and relished from start to finish. If the attack of a mad axeman is your thing, then Gales is absolutely the real deal. The mysterious “It”. The magic ingredient. The Factor-that-shall-not-be-named. 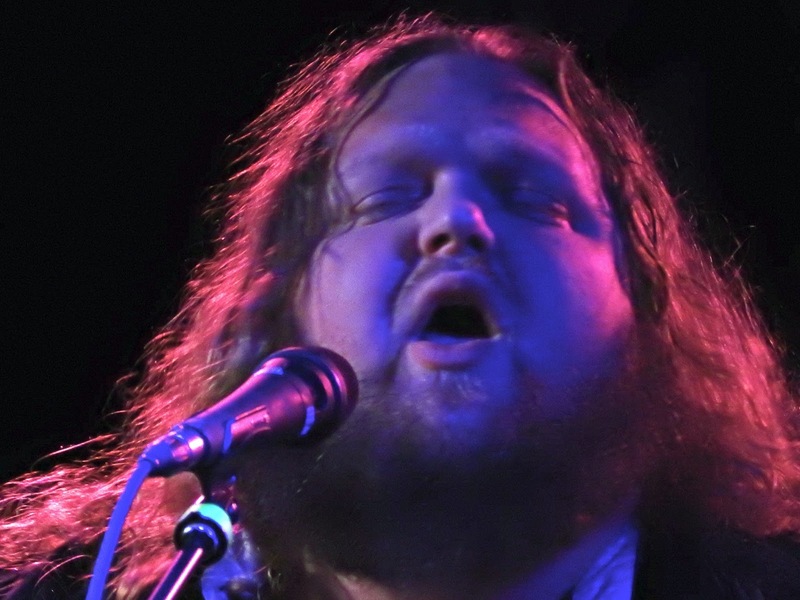 Whatever it is, Matt Andersen’s got it. This genial giant from New Brunswick strolls onstage and sits himself down with his acoustic guitar, and he’s got the crowd on side before he’s even sung a note. And when he does start singing – well, wow. 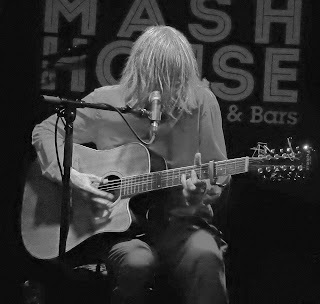 As ‘The Gift’, from his latest album Honest Man demonstrates, he’s the owner of a magnificent, versatile voice that can be both mountainous and sensitive. Add in some sparkling guitar breaks and effective use of dynamics, and the end result is a mash-up of blues and soulful folk that brings to mind Richie Havens. ‘I Play The Fool For You’ is clearly in blues territory, and features a slide frenzy that eventually collapses into a playful conclusion. ‘Quiet Company’, on the other hand – his mum’s favourite from Honest Man, he tells us – is beautiful, displaying delicate guitar picking. ‘Coal Mining Blues’ is gritty and down to earth as it paints a picture of a miner’s tough existence, featuring evocative lines such as “roar of a lion, breath of a mouse”. Sounds just seem to emerge from the guitar as Andersen’s mitts work their magic, often with a real sense of wit, ‘Round And Round’ featuring what Andersen justly celebrates as “probably the happiest guitar riff I’ll ever write”, and gets all and sundry singing along happily to the chorus. 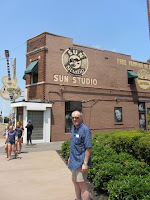 ‘Have You Got The Blues’, meanwhile, offers up a blizzard of guitar work and a towering vocal ending. If ‘My Last Day’ has an interesting lyrical theme, with Andersen contemplating what he’d do if the end were nigh, ‘Devil’s Bride’ is a wonderful piece of storytelling, about that married couple you see in the pub who are brewing for a fight all night, until finally the guy explodes – and it has a great tune to match. indeed seem like old friends. The Mash House isn’t a big venue, but on a Monday night and with limited publicity Matt Andersen attracted a vigorously health turnout. Some were evidently devotees – Canadian expats, maybe. Others were evidently newcomers, judging by the healthy business the merchandising desk was doing in CDs once he was done. I’m betting that however much they’d heard before they came in, they all headed home as fans. Cowdenbeath resident and 2014 British Blues Award nominee Reece Hillis filled the support slot, and made his own impressive contribution to the night. Focusing mainly on covers, his default setting is to throw himself into songs with abandon. So right from the off, with ‘Whole Lotta Shakin’ Goin’ On’, he goes at it with gusto and a powerful, gutsy voice, behind a curtain of flailing hair,. It’s crowd pleasing stuff, similarly effective on a medley of ‘Roll Over Beethoven’ and ‘I Hear You Knockin’’, as well as the set-closing, slowed down ‘Shake, Rattle’n’Roll’. But he’s just as compelling as he coaxes sweet chords out of his 12-string on the classic ‘Sunny’, gets soulful on Leon Bridges’ ‘Smooth Sailing’, and does a nice job on his own, quieter ‘Come On Back’. Reece Hillis demonstrates that you don’t need a Marshall stack to rock’n’roll. With his cadaverous features and trilby hat, Thorbjorn Risager looks more like German conceptual artist Joseph Beuys than your typical blues man. 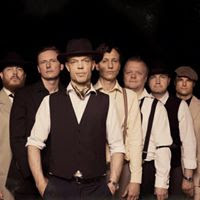 Don’t be fooled though – Change My Game is a multi-faceted blues treat from the Danish bandleader and his gang, The Black Tornado. if the cool and subdued opener ‘I Used To Love You’ has an air of ‘Thrill Is Gone’ about it, Risager manages to convey more than the usual wistful regret; he hints at distaste, having been taken for a ride. The album is also held together by a full, soulful sound in which the horns of Kaspar Wagner, Hans Nybo and Peter Kehl add plenty of colour, ranging from the subtle undercurrent on the contemplative, pulsing ‘Long Gone’ to bold and brassy on the likes of the driving ‘Hold My Lover Tight’. But when The Black Tornado really find their groove the mainspring is drummer Martin Seidelin, who gets himself fathoms-deep in the pocket. ‘Dreamland’ and the title track build on that groove with big, fat, fuzzy riffs from Risager and guitar buddy Peter Skjerning. The former builds up to a big, Stax-like conclusion, while ‘Change My Game’ with its throbbing funk sound, suggests that Risager and co have studied the later Stax moves of Isaac Hayes. They take a slightly different tack on ‘Maybe It’s Alright’, on which the parping horns, swirling organ, female backing vocals and ringing guitars vaguely suggest the Stones in the manner of, say, ‘Happy’. Or maybe not – but it’s still a rocking chunk of R’n’B. hollering and moaning, and perhaps the least successful track on offer, but even it’s enlivened by some N’Awlins jazziness from Kehl’s trumpet. ‘Train’ may be another blues cliché, complete with “fifteen coaches”, but with its clanking percussion it still works – and who doesn’t like a train song? More adventurously, they manage to weave an Eagles-like feel into ‘Hard Time’, with some twanging guitar, but between Risager’s voice and the closing horn riffs they still tie it into their soulful blues vibe. The real outlier is penultimate track ‘Lay My Burden Down’, a sparely arranged minor key ballad that suggests a distinctively European sensibility with its Jacques Brel-like feel. They come back to the fold with closing stomper ‘City Of Love’ though, on which they uncork another big fat fuzzy riff, before ultimately spiralling away on an organ solo and some wailing guitar, like a tornado receding into the distance. Change My Game may lack a stone-cold classic song to hang a gold medal around, but it’s a sterling collection of impressive material and musicianship from a top notch band, and it demands repeated listening. Go for it! His concern was understandable, given that King King’s audience surely draws on fans of Free and Bad Company. Would a bundle of them forsake Nimmo and co for the night in order to Rodgers do his ‘Free Spirit’ show at Glasgow’s Armadillo (aka the Clyde Auditorium)? In the event he needn’t have worried. King King have their own loyal fanbase these days, and if the room isn’t jam-packed by the time they come onstage, it’s still well busy. Wisely, they’ve freshened things up by shuffling the set list, after focusing heavily on the King King Live selection during recent tours. Coming on to the audience belting out a rousing chorus of ‘Alright Now’ to their entry tape, they launch into ‘More Than I Can Take’, with previous opener ‘Lose Control’ moved downstream to mid-set. Later, ‘Jealousy’ is rotated out of proceedings in favour of another of the classic soulful moments from Standing In The Shadows, their exquisite take on Free’s ‘Heavy Load’. And in addition to the old, the borrowed and the blues, they serve up something new with ‘She Don’t Gimme No Lovin’’, set to be the first single from forthcoming new album. With a prickly guitar intro redolent of AC/DC’s ‘Thunderstruck’, it’s a radio-ready rocker that a horse racing pundit might describe as “by Whitesnake, out of Thunder”. It’s a breezy affair, with a nifty key change and nestling in the middle an opportunity for a fresh singalong in the future. The lynchpins of the set continue to captivate though. The second number, ‘Wait On Time’, is an effortless gear changer to get everyone moving. With Wayne Proctor shuffling on drums, Lindsay Coulson strutting on bass, and Bob Fridzema grooving away on organ, the Fabulous Thunderbirds track is a slab of blues-funk they’ve made their own. The crowd have the singing on ‘Rush Hour’ down pat nowadays, while ‘You Stopped The Rain’ has become a veritable showstopper, with Nimmo soaring away to wonderland on his vertiginous closing solo, drawing whoops of appreciation at its conclusion. "It's time to let Bobby loose on you!" when he delivers the final verse a yard back from the mic, to good effect. He’s not kidding when he sings “We’re gonna get funky” on the intro to ‘All Your Life’. Get funky we do. As danceable a rock track as you could ask for, it still has its subtleties, with Proctor and Fridzema chopping up the rhythm big time during the latter’s solo, while Nimmo contents himself with holding down a tick-tock funk groove on guitar. 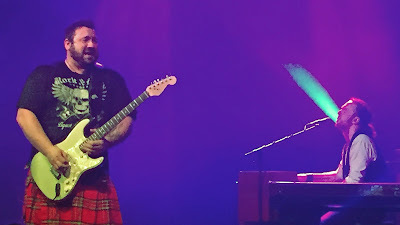 By the same token, the epic set closer ‘Stranger To Love’ doesn’t just feature Nimmo’s totemic ‘silent running’ guitar passage; as his solo takes off again Proctor – the master of the booming drum sound – and Coulson get up to all sorts of rhythmic shenanigans beneath it. My other half was disappointed to find that the encore was ‘Waking Up’ rather than her favourite, the sunshine funk singalong of ‘Let Love In’, and maybe she has a point. If they felt in need of a change then there may be better candidates to round the night off, like ‘Can’t Keep From Trying’ or ‘Crazy’, perhaps. But hey, who cares? 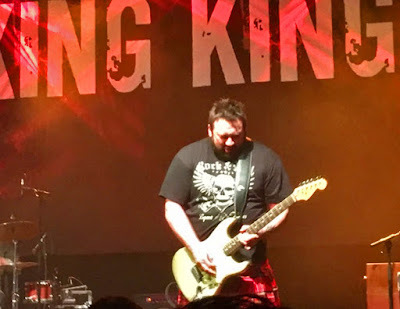 Alan Nimmo appears to be operating at full throttle vocally again, there’s a new album in the offing, and this show reaffirmed what we already knew – as a live act, King King always deliver. Let the good times roll!